Something 'Slamtastic' is Happening at Denny's! Super heroes are all the rage, so it's no wonder that Denny's is tapping into their power source and teaming up with 20th Century Fox to showcase the upcoming adventure, Fantastic Four! 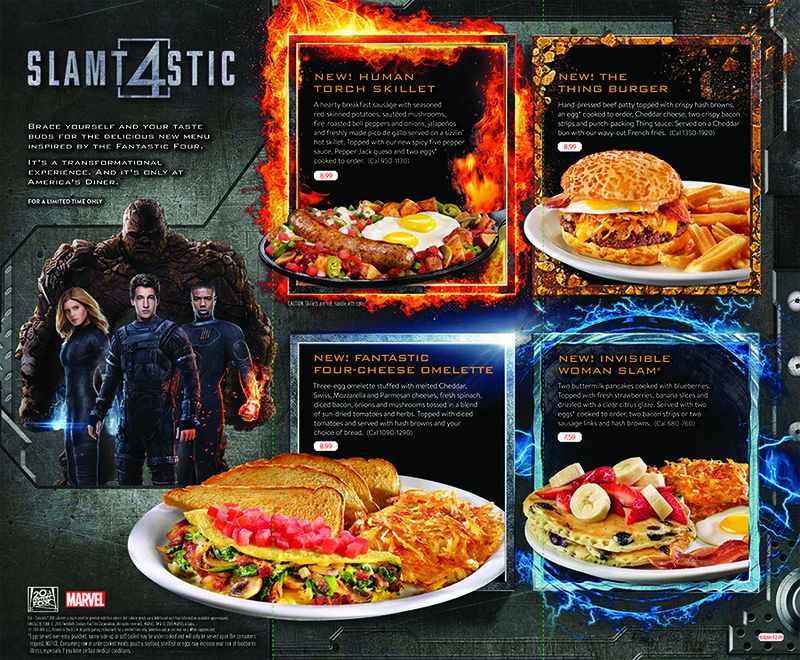 This week, as of June 23rd, Denny's launched a "Slamtastic 4" specialty menu at its restaurants that includes meals like The Thing Burger, a sizzling Human Torch Skillet, a delicious Fantastic Four-Cheese Omelette, and the Invisible Woman Slam®. The kids loved seeing the Fantastic Four characters on the menus and signage throughout Denny's. They're excited to see the film this summer! Since we only had treats, I enjoyed half of a chocolate shake and fries, I am anxious to return and try out the Human Torch Skillet or the Fantastic Four-Cheese Omelette! My other daughters love fruit with their pancakes so the Invisible Woman Slam will be calling their names. In addition to the main meals, there is a new Fantastic Four-Fruit Smoothie & the Dr. Doom Lava Cake. They all look amazing, and the smoothie will be a great healthy option when you're not feeling super hungry. The portion sizes are always very adequate, and the adult meals are big enough to share between the kids. They've revamped our Denny's menus and labeled items as gluten-free! Oh, and get this – I spotted options for gluten-free English muffins! I will be checking those out on my text trip and will give a full report for my gluten-free readers. It's so awesome to see changes being made to accommodate allergies. Remember that if you do have an allergy, let them know so that appropriate measures will be taken to prevent cross-contact issues. Not only will the restaurant be showcasing stellar menu imagery and new meals & desserts, but now through July 19th, you can enter to win the ultimate FAN trip for two, to the Fantastic Four movie premiere on August 4th!! All you need to do is visit www.dennysfantastic4.com and enter to win! I don't know about you, but I am excited to see this film in August. I'm also interested to see a new story and rendition of this age-old classic hero film. But we don't have to wait until the film releases before we can get a taste of the movie. You'll see TV spots the week of July 6th and if you follow Denny's Diner on Instagram (@DennysDiner), you can check out exclusive clips of the film! Have you tried out the new menu items? What did you think?! Disclaimer: I am a Denny's Diner ambassador and am dedicated to sharing the latest and greatest Denny's news with you. While I have been compensated for this post, all opinions are 100% mine and always magical.